Second Stringers is a Superlink character folio detailing characters ranging from PL6–8. These characters make great sidekicks, off-color npcs, or street-level heroes. Each entry includes plot hooks, villain options, history/origin, and full-color art. With 10 characters in all, Second Stringers is a perfect addition to any campaign. I know when I think about purchasing a pdf, I always wonder what kind of characters are in it. Well I've decided without giving too much away I would post a brief list of the characters found in this accessory. Everyman - He (or she) who watches the watchmen? I was excited to see this product from the moment I read the preview character, Bandita. I have to say that I wasn't let down. I can see definite uses for all of these characters. As a note a two of the characters use powers from Ultimate power, something I was confused about at first. Well, Second Stringers is finally out. After a few computer glitches and troubles, I'm happy to finally have this project completed. 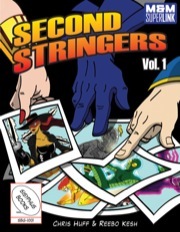 Now we're on to Second Stringers vol 2 and Rogues Gallery. Check out our threat over at the ATT for more details. I'm definately looking forward to seing more Second Stringers and I'm sure Rouge's Gallery will be just as good.